However, most of these ideas are not based on facts but are just theories. We should not forget that the moult is influenced by many factors. One of the key factors is the time the pigeons are paired and the way in which the pigeon is placed on widowhood. Pigeons that were paired in November and that could raise two nests in a row will usually moult earlier than pigeons paired at the same time, but which were separated after the first nest and before breeding a second. We have for instance, several long distance racers who breed birds early in the season but who take away the hens as soon as the youngsters are 14 days old. 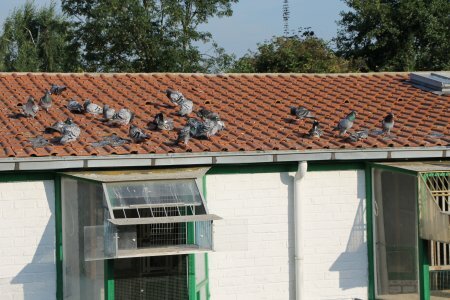 The pigeons are then paired for a second time in April and separated again after a few days of breeding (maximum 8 days). With this approach the bird will drop its first primary by mid June. Pigeons that belong to the same stock and that were paired at the same time but which could raise two nests in a row will have already dropped their third or fourth primary by then. So basically these birds moult faster compared to the birds that were separated in between the two nests. Some fanciers would conclude that long distance flyers moult later in the season, but in this case it has nothing to do with the bird being a long distance or sprint racer. It has everything to do with their preparation for the competition. The fanciers that raised two nests in a row and that placed their birds on widowhood on the third breed have their widowers in top form already in April, but these pigeons will no longer be fit in mid May. That is when most of the sprint fanciers give their old birds a break because they are focusing on the young birds races by then. Most of the long distance racers however, will only start to race their old birds then. They aim to get their pigeons in their best form by mid June, because that is when the important races are scheduled: the long distance classics are organised between mid June and the end of July. Some pigeons will have dropped only two primaries by mid July, as a result of the special preparation for the long distance classics. It does not mean they moult slower compared to the sprint racers, who have dropped five to six primaries by then. Keep in mind that a widower is past its best as soon as it has dropped its fifth primary that season. But there are more factors that decide whether or not a bird moults. If the temperature in the loft is high and if the fancier uses a lot of artificial light the pigeon is likely to moult earlier. Besides, any infection or disease will slow down the moult as well. But it is also a fact that two pigeons housed in the same loft and under the same circumstances will moult in a different period of time. In 1985 I had a couple of youngsters born in September from Herman Van Den Broeck from Berlaar. One of these youngsters, called Vaalke, probably because of its light red colour, moulted four primaries in that same year. Its nest brother however, a dark coloured pigeon (Zwarte), did not drop a single primary. When I wanted to make a selection a fancier from the neighbourhood joined me and he told me he would get rid of Vaalke: in his opinion, this pigeon was a weakling because it had moulted way too soon. On the contrary, the dark coloured pigeon Zwarte was one of his favourites. The fancier could not understand that I wanted to keep Vaalke at all cost so he left. As a yearling the two pigeons were trained at the same time. Neither of the two ever arrived in time and the two were blacklisted for the next selection. Luckily enough it was Raymond Van Steenberghe, a good friend of mine, who pointed out that Vaalke was in fact a top class pigeon. He advised me to prepare her for Bordeaux as a two year old. Since one pigeon does not make a difference I decided to keep Zwarte, the nest brother of Vaalke, as well. On a Sunday in May 1987 the two were basketed for Noyon; expectations were low, but they did a great job: Vaalke won the second prize, Zwarte finished fifth. In the same season Valke won four times per ten in Hafo Lier and Union Antwerp. A 19th national prize from Bordeaux was his best result of the season. From time to time Zwarte managed to win a prize as well but it could no longer win top prizes. In this case the two pigeons clearly belonged to the same stock since they were bred from the same nest. They were also housed in the same loft so this does not explain why one pigeon moulted earlier than the other. The fact that one pigeon was more successful than the other probably has nothing to do with the fact that it moulted earlier than the other bird. But it would also be nonsense to say that the bird that moulted earlier is a weakling. The loft of Jos De Swert from Kessel tells a different story. One of his best flyers, a blue white bird, kept four tail feathers after the big moult. 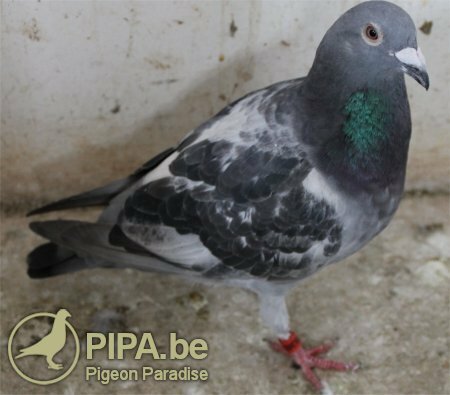 Most fanciers believed that the pigeon was past her best as a racer, but we examined her and we still considered her one of the favourites for next season, despite the four old tail feathers. The pigeon had a perfect throat and a very fine plumage so we were confident that she would be fine. We were lucky: in the next season the hen had its best racing season ever. These two examples of moulting birds illustrate that there are many untruths and myths about the moult. Fanciers tell stories about pigeons they have never seen with their own eyes. Still, many fanciers give credence to these myths. The best advice is to take most of the stories about the moult with a pinch of salt. If you believe all of the stories and if you heed the advice based on these stories it might influence the performance of your own pigeons. If you want to become a successful fancier you should not pay too much attention to myths. You have to keep your feet on the ground. It is a matter of common sense. Some fanciers think that a slow or a smooth moult tells us something about the strength of the pigeon and indicates whether it will be a sprint or long distance racer. We do not believe such theories. In order to keep your racing pigeons healthy it is necessary for them to take a weekly bath. During a hot summer it is advisable to give them a bath twice a week. If a pigeon does not like to take a bath it will not take one. But if a pigeon feels well after a bath you will notice it will even take a bath twice a day. Keep in mind that a bath strengthens the organs of the pigeon and that it takes away any dirt from their feet and feathers. Ik vind deze artikels steeds leuk om te lezen.